While preparing for the Kickstarter campaign (hint hint) Mom Vegan and I convinced the grand parental units to take little vegan off our hands for a week. This meant few road trips down to beautiful Oregon for drop off and pick-up, which I don’t mind because that means we get to stop in Portland! DFV LOVES PORTLAND. Normally the Seattle to Salem run entails a stop at the well known Portland vegan eatery The Red & Black Café (full vegan) or one of my guilty pleasures, Burgerville (vegan if you order right). After the last two road trips we now have another stop and it is a WINNER. The A.N.D. Café has a name that can be ridiculously hard to find on Google but it is well worth the effort. Brought to you by the same folks that own the veggie “Off the Griddle’ food truck, Ashley n’ Dan, A.N.D. is O.t.G.’s vegan brick and mortar companion. I don’t know if waffles are meant to be a house specialty but A.N.D. does them right. The first time through it was early enough for breakfast and we opted for the special of the day, a Strawberry/Rhubarb Pie Waffle and the Hash brown nests filled with Tofu/Pesto Scramble with tempeh bacon. Both were fantastic. The waffle was light and fluffy like a real waffle should be, (unlike the frozen discus things we throw in the toaster) and the ‘berry/’barb’ filling was excellent, with the right amount of Rhubarb tartness to keep the dish from being overly sweet. The little kid in me loves the hash brown nest, I can’t tell you why, but I do. The taste of the hash browns did not suffer from the molding process and they retained the correct texture as well. The scramble & sauce were both above average and I wouldn’t hesitate to order them again. On our return trip we stopped by later in the day so we could try lunch and it lived up to the promise of our breakfast a week earlier. 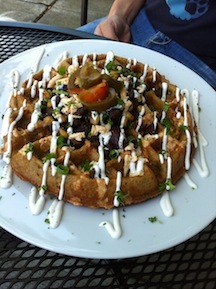 The Special that day was a Southwestern Style waffle made from corn meal covered with Black Beans, Salsa, Cilantro and the ingredients one usually finds in SW dishes. 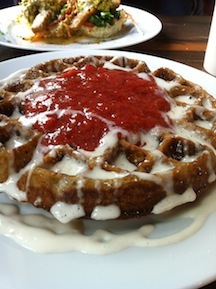 Once again the waffle itself was corn muffin-esque perfection and the toppings were stellar as well. Unfortunately the café had run out of its stock of hash brown baskets so we had to go to plan B. 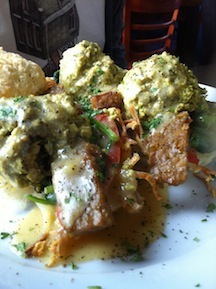 At the suggestion of our mega-awesome server Ryan, we tried the Buffalo Chiggun Salad. One the thing you need to know about your DFV reviewer is that I am a sucker for anything with Buffalo sauce (that and Reuben sandwiches). 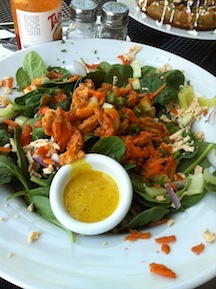 The salad was as good as promised and I cannot wait to stop by for another. A.N.D. Café is a place firing on all cylinders, excellent creative food, a super nice and attentive staff, pleasant atmosphere and all at a reasonable price. This entry was posted in Feilipe's Rastaurant Adventures, Felipe's corner and tagged felipe's cor, felipe's corner, restaurants. Bookmark the permalink.